I was 18 when I first drove a tractor. I was 24 when I sat in a combine. I was 27 when taught to ride a horse. Agriculture, like any subject, requires education—and it’s never too late to learn. On July 12, 2018 (at the age of 29), I attended my very first Field Day, hosted by MSU’s Central Agricultural Research Center (CARC) at Moccasin. 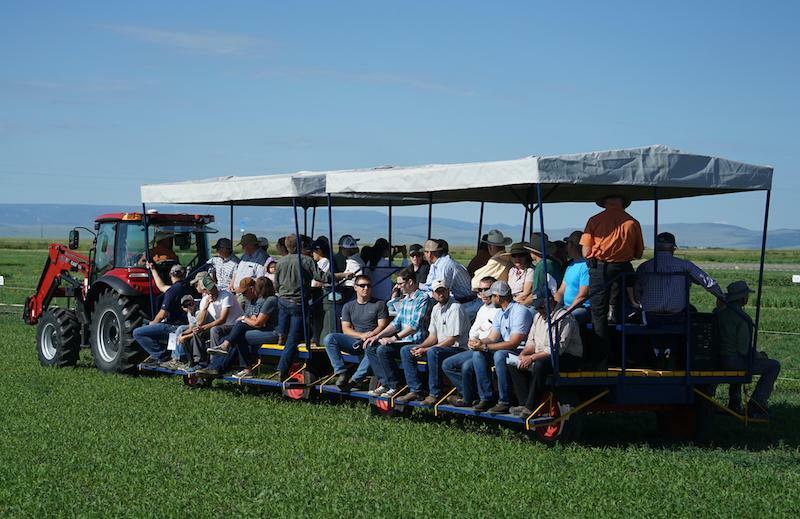 Field Days (for the uninitiated) are free annual events that take place throughout Montana, providing area producers, legislators, agribusiness representatives, and everyday Montanans an opportunity to learn about the people, places, and projects involved in MSU’s agricultural research. Another alternative crop discussed was hemp, which is not the same as marijuana. Hemp is a plant with many industrial applications and no value as a recreational drug. Due to the association with cannabis, however, it is closely regulated. Suffice it to say, much was thrown at me over the course of the morning—the benefits of pulse crops on nitrogen in soil, the community structures of microorganisms in relationship to crop rotations, how producers might respond to an increase in anomalous weather events. I’m no farmer, so my understanding of these issues was limited (at best), but even a greenhorn could see that this research mattered to Montana. Agriculture is easy to overlook when you live in an urban area. It’s easy to forget Montana’s farmers and ranchers when they don’t live next door. What can’t be ignored is agriculture’s impact on our state’s economy and its role in feeding our world. You don’t have to work in the industry to show Montana’s ag community support. Take the time to visit with farmers and ranchers. Attend a Field Day. Make an effort to learn. From rural Montana to the “big city,” agriculture affects us all.